The Rumor Queue: Disney’s Skyway to return as resort transportation? Could a skyride system, such as this one still in use at Busch Gardens Tampa, be used to transport guests around Walt Disney World? I have to remind myself that most park-goers can’t get around by flight like me (owls admittedly do walk when our wings are tired), but perhaps that will change in the near future. Credit where credit is due: fans on the WDWMagic forums discovered permits and structures that seem to indicate Disney intends using a skyway-type system as a means to transport guests around Walt Disney World Resort. Admittedly, I was skeptical. Several sources have vouched that this rumor isn’t far-fetched. 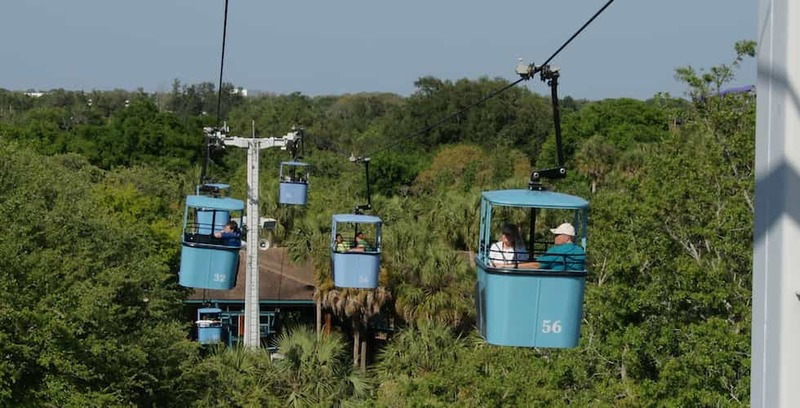 John Frost over on “The Disney Blog” (unofficial) first wrote of a gondola aerial transit system being a viable solution for Disney World Resort’s transportation troubles. Disney has reduced the hours of their monorail system in recent years, and malfunctions or mishaps put the resort at a major disadvantage because of the lack of alternatives. If you’ve had to use a monorail on the resort in recent years during peak hours, you’re all too familiar with the congestion and long waits. While it may sound strange, aerial transit or gondola systems are being proposed in Chicago, Ill. and Austin, Texas as a cost-effective solution for transit congestion. Disneyland and Magic Kingdom parks at one time boasted the Skyway. The former closed in 1994 and the latter closed in 1999. According to Frost in the article cited in the previous paragraph, an air transit system would be much cheaper than expanding the monorail track and adding additional vehicles. Not only that, but a mass air transit system could give guests an aerial view of the resort (going by air is inherently more interesting than by ground), transport a large capacity to offset the strain placed on the other transit systems, and could run on renewable energy to boot. From what I’ve been told by a source, the maintenance of a gondola air transit system would have cheaper maintenance than the monorail system. It’s rumored the air transit system will be routed to transport guests between Disney’s Caribbean Beach Resort, Disney’s Hollywood Studios, Epcot and Disney’s Art of Animation Resort. It’s even rumored that construction has already begun. I expect we’ll learn more in the coming months if the rumor is true and an announcement is made. Perhaps one day we’ll see each other in the sky, but until then, keep using the ground. • Fowl Owlerson has been attending theme parks since he was a little owlet. When he’s not filtering through the latest murmurings around the industry, he can be found writing, reading, and snacking on the occasional rodent. Follow him on Twitter @fowlowlerson for the latest rumors, and drop an anonymous letter to him at info@attractionsmagazine.com or via Direct Message on Twitter.